What started with a little girl hanging streamers, rallying her family toward the holiday or tradition at hand, has grown into a full-blown career. When one takes a look at Sara Martin’s life, it’s evident she has a gift of celebrating. The fantastic news for Waco, Texas? She’s sharing with all, the art of hospitality. I have a hunch that Sara’s the woman who enters a place having noticed the plants growing in the yard on her way in, sprigs useful for a table setting, an unconventional vessel that no one else might have considered. I imagine she’s one who effortlessly pulls everything together, making the moment, the meal, the event, the day that. much. more. special. She’s a gatherer – of things, of people. This is who she is. For our city, she has done this (again)! 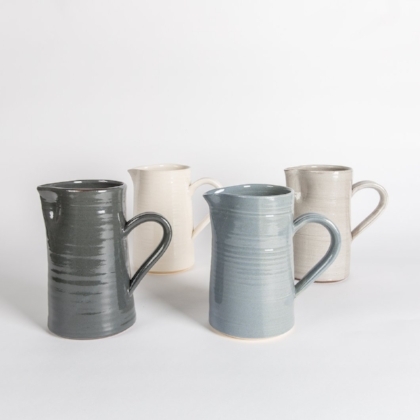 She and her husband, Jonathan Martin, owner and lead ceramicist at Black Oak Art, were looking for new ways to sell their pottery. 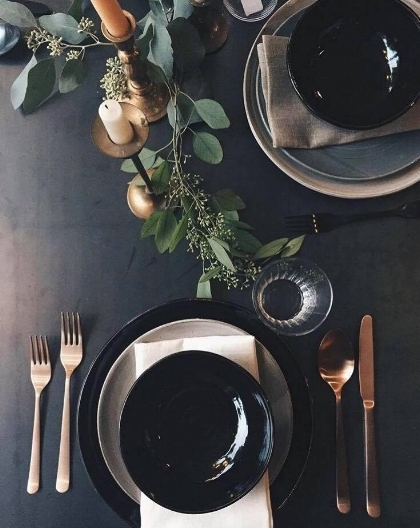 Black Oak mainly throws pottery for their wholesale accounts, selling ceramics like mugs, platters, planters to various local shops, one of which being Magnolia Market, some nation-wide. “I reach out to artisans who are already making really great products and I’ll bring a shape or an idea and we collaborate on those. It’s not like, whatever they are making, I’ll carry. It’s specific to Gather; they’re not going to sell that product anywhere else in Waco. Ellen Mote of Ellen Mote Jewelry sells really amazing jewelry at Wildland and she may have some pieces at Magnolia. I just love her jewelry so I came to her with a couple shapes and we hammered out what would work as a napkin ring. 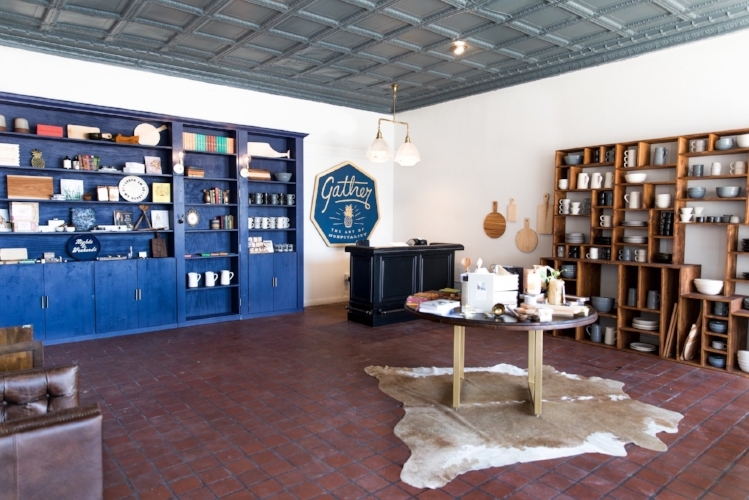 Jonathan and the potters at Black Oak Art throw a whole line of dishware and home goods exclusive to Gather, but first, I come to them with either a shape or a style that inspires the actual look of the piece. Leslie Medlin Design House was born in Waco. (Leslie has since moved to Raleigh, North Carolina.) Her background’s in fashion. She sews really well. She makes all of our napkins. Josh Morgan’s company called Line does our wood and, soon, some metal work. We’re working on some prototypes right now. Josh did wedding photography and we met when I owned Kindred Event Studio. He makes one board for Magnolia. 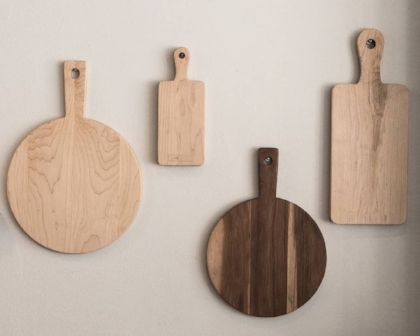 I brought him a bunch of different shapes, we did the prototyping process, he does all of our cutting boards. Our aprons are done by Mary Claret, a company founded by Andie Day. She’s a Waco-based linen/clothing line. Andie’s a professor at Baylor in the fashion department and makes really amazing linen skirts. She has retailers in Dallas and Austin and she does pop-up shops. We came up with a couple of designs. “I love the size of Waco; we love the community we found here both with our personal community, with our church and our friends, but also with the town’s business owner community. what Does it Mean to You when someone chooses to shop local? What Does it do for Waco when waco buys local? Speaking of employing people, after Gather’s first six months, Sara chose to hire employees rather than pay someone to watch her three children. She also designed a space in the back of the shop just for her kiddos, for sick days or whenever they had to, had to come in with her. Hospitable to the core! What really stood out about Sara was the lack of pretension and how, the deeper you look, the more there is to celebrate. She’s a friendly, girl next door kinda woman, and I think that’s her key: she keeps it simple + goes after what she dreams up and really wants, no more, no less. So, not a Pinterest-perfect thing? If you want to increase connection or the art of hospitality in your life, Sara’s store is the place for you. Zip by Gather! And before you do, download the Towny app. Towny’s an easy way to keep it local, supporting friends and neighbors’ dreams + bolstering your local economy AT THE SAME TIME! Yours in seconds here!